Small town in Moldavia, district of Bakau. The census of 1820 reported forty-two Jewish taxpayers in the town, who constituted the larger part of the population; they were engaged in the exploitation of petroleum-wells, which abound in that region. In 1860 the Jew Wolf Lazarovici installed the first petroleum-refinery, and six years later he built a paraffin-factory. The town and the district passed later into the hands of the Theiler brothers, naturalized Jews, who developed scientifically the output of petroleum and paraffin, and gave a remarkable impetus to the industry in that region. In spite of the fires which periodically devastated the town, the Jews of Moineshti were prosperous until 1880, when the expulsion of a large number of Jews from the neighboring villages increased the Jewish population of Moineshti, but diminished its prosperity. In this town the first group of Rumanian emigrants and colonists was recruited for Palestine in 1882. 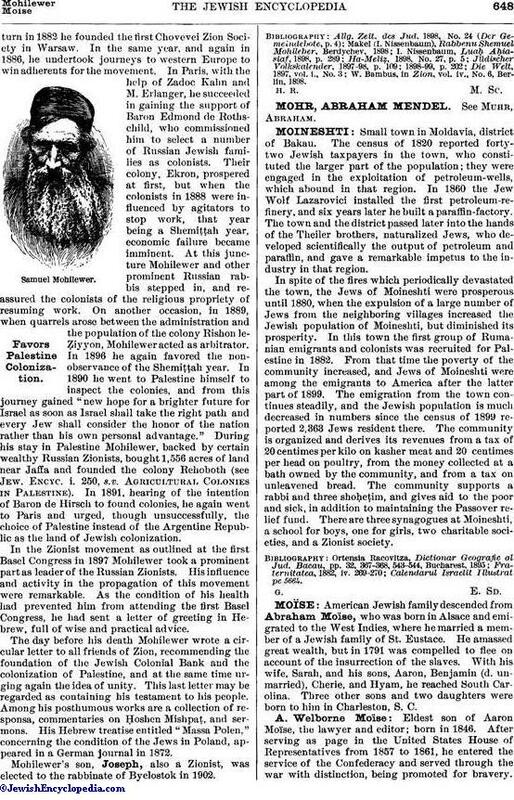 From that time the poverty of the community increased, and Jews of Moineshti were among the emigrants to America after the latter part of 1899. The emigration from the town continues steadily, and the Jewish population is much decreased in numbers since the census of 1899 reported 2,363 Jews resident there. The community is organized and derives its revenues from a tax of 20 centimes per kilo on kasher meat and 20 centimes per head on poultry, from the money collected at a bath owned by the community, and from a tax on unleavened bread. The community supports a rabbi and three shoḥeṭim, and gives aid to the poor and sick, in addition to maintaining the Passover relief fund. There are three synagogues at Moineshti, a school for boys, one for girls, two charitable societies, and a Zionist society. Calendarul lsraelit Illustrat pe 5664.